In the 1880’s the Bowdish Family started the first of what would become a series of respected boat building companies – these would eventually change and grow over time to design and introduce in the 1930’s the famous Lightening sailboat. By then they were out of the picture by many years but they can be credited for starting commercial boat building on the lake. They were also both oil painters specializing in landscapes. For more information on the boats and the Bowdish family stop by The Creamery – The Skaneateles Historical Association in Skaneateles. The Bowdish family moved to Skaneateles in 1876 and started Bowdish and Company in the 1880’s a manufacturing company of small boats, canoes, small sailboats and steam launches. They invented and held patents for their steam engine improvements. This company later became the Bowdish Manufacturing Co. and then changed to become the Skaneateles Boat and Canoe Company in 1893 which was started by two Bowdish employees George Smith and James Ruth. Both Edward Romaine and his father Nelson S. Bowdish painted and were active artists. Nelson remained in Skaneateles and painted landscapes and Edward Romaine moved to Yonkers and remained a professional artist for his lifetime. 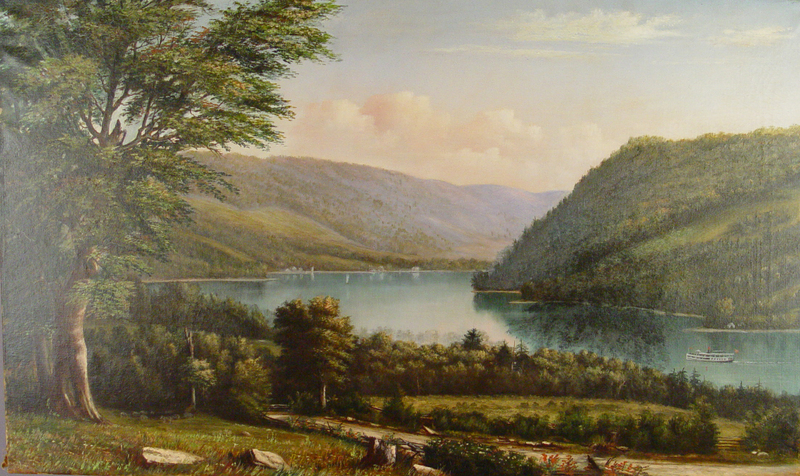 Their pictures are found in many Skaneateles homes and their style, different from John D. Barrow’s, can be recognized by many who collect and appreciate local landscapes. For more information on the boats and the Bowdish family stop by The Creamery – The Skaneateles Historical Association in Skaneateles. Thanks to Barbara Bendall Spain and Karen Richards Anklin for their information on the Bowdish family and boat building in Skaneateles, found in Skaneateles …Glmpses of the past, 1987 available at The Creamery. Nelson S. Bowdish an aged and respected resident of this village died at his home on East Genesee St. at 4:45 o’clock Monday afternoon April 3, 1916 in the eighty-fifth year of his age. Mr. Bowdish was born in the Town of New LIsbon Otsego County N.Y. December 19 1831 and when a young man moved to Richfield Springs. He served in the Civil War, acting as Adjutant of the Third Regient of the Volunteer Light Artillery, State of New York, ranking as Captain of Infantry from which service he was transferrred. While residing at Richfield Springs he became past master of Richfield Springs Lodge and High Priest of Richfield Springs Chapter, R.A.M. Mr. Bowdish came to Skaneateles in 1876 and with the exception of some years spent in Clayton, NY and Cornwall on the Hudson, NY had made the village his home. He was in early life a builder of church organs and later engaged as a photographer but his life work was as a landscape artist. Many of his pictures are owned in Skaneateles, while others are owned in various parts of the state. He possessed the spirit of a true artist and was a great lover of nature. He was a warm admirer of Skaneateles Lake and of the charming scenery of the locality and of other parts of his native state. He had many warm personal friends in Skaneateles. He was sensitive to a marked degree and of retiring disposition. He had suffered many years of paralysis. The last and fatal attack about a week ago. Mr Bowdish had served as Village Trustee and was a member of the Ben H Porter Post No. 164 G.A.R. of Skaneateles. Mr. Bowdish leaves surviving a daughter Miss Flora Bowdish of Skaneateles, who had ministered to him in his declining years, one son Edward R. Bowdish of Yonkers, NY and a grandson Dr. Palmer Romaine Bowdish of Cornwall NY, also one brother Emory M. Bowdish of Skaneateles.